FX4 Package! Panoramic Roof! 360 Degree Camera! Tow Package! Navigation! 10-Speed Auto! 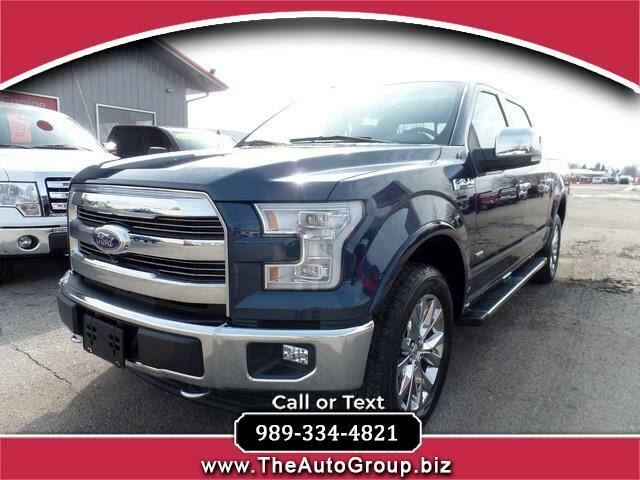 Our great looking 2017 Ford F-150 Lariat SuperCrew 4X4 in Blue Jeans meets and exceeds your expectations of performance, efficiency and dependability. Powered by a TwinTurbo 3.5 Liter EcoBoost V6 that delivers 375hp while connected to a 10 Speed Automatic transmission. With this Four Wheel Drive, master each day with incredible towing and payload capacity while attaining near 23mpg on the highway. With just one look, you can see this Lariat is a handsome truck that features a chrome grille, LED box lighting, and fog lights. Open the door to the comfortable cabin to find that it has been intelligently designed to let you work smarter with a customizable productivity screen, push-button start, multiple power points, dual-zone automatic climate control, ambient lighting, and dynamic hitch assist. Find your spot in the heated/cooled leather front seats, admire the wood trim, and grip the leather-wrapped steering wheel. You ll love that SYNC 3 and SYNC with AppLink provides everything you need to get in touch, be entertained and stay informed with enhanced voice recognition, a touchscreen, available WiFi, impressive audio, smartphone integration and more! This lean muscular machine from Ford offers a high-strength military grade aluminum-alloy body and high-strength steel frame provides peace of mind. It also takes care of you with anti-lock disc brakes, stability/traction control, trailer sway control, a multitude of airbags, and MyKey. Own the scene with full power behind the wheel of our Ford F-150! Print this page and call us Now... We Know You Will Enjoy Your Test Drive Towards Ownership!